Cripes. 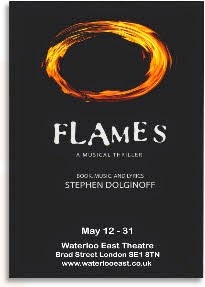 Flames is described as a “suspense-filled musical thriller” but whether intentional or not, it proved to be one of the funniest things I’ve seen this year. Its campy, schlocky vibes are like an episode of Sunset Beach happening before your very eyes and yet played with such seriousness, I’m really not sure that that is what they were aiming for at all. 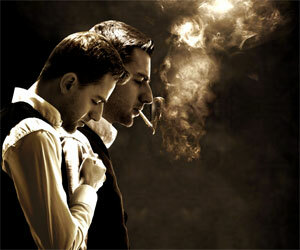 Stephen Dolginoff – whose Thrill Me has recently been revived for a UK tour – once again takes on sole duty for book, music and lyrics to explore murderous mystery but I’m not sure these flames have ignited in the way he might have intended, here at the Waterloo East Theatre. People often assume that I’ve been to every theatre in London, more than once, and though it may seem like it, there are just so many and new ones opening all the time that not even I can make this boast, yet. The Tristan Bates Theatre, tucked away in a Covent Garden back street near Fopp, is one place I haven’t been before and so my trip to see American musical Thrill Me: The Leopold & Loeb Story meant I could knock more off the list. It is based on the 1920s true story of wealthy Chicago teenagers Nathan Leopold and Richard Loeb and the twisted relationship that existed between them as they searched for the ultimate thrill. Their raft of misdemeanours took a darker turn though as the crimes got more serious in order to make the thrills bigger, culminating in the ‘perfect crime’ – the murder of a young boy in 1924. The story is told in a series of flashbacks as we start in 1958 at the parole board hearing of Leopold.